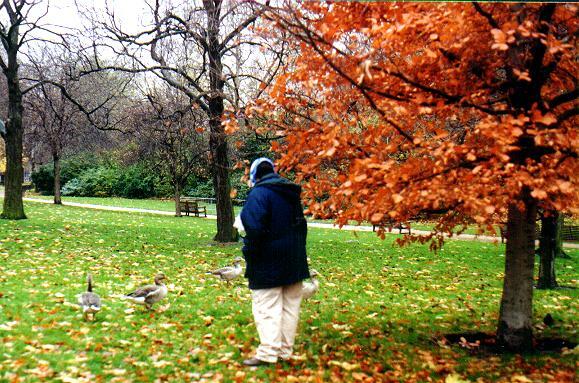 It was late November of 2000, hardly an ideal time to spend a week in London - especially during an unusually rainy autumn. But it was a chance to see the children again, and after all the weather wasn't all that great in Oklahoma either. 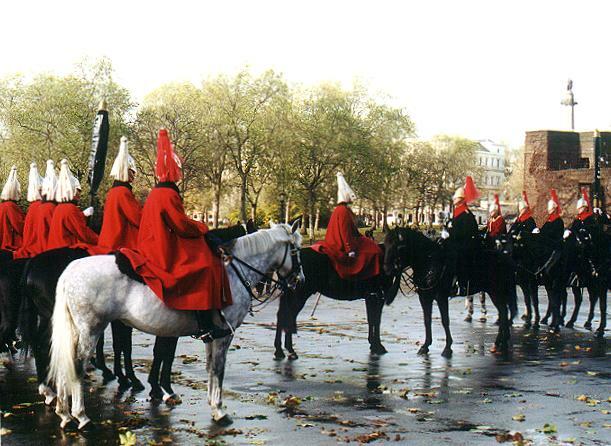 And Phyllis had never been to London before. So we went. 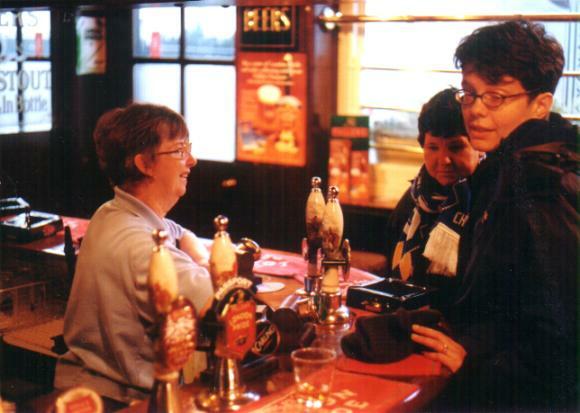 Christine, at the pub, was delighted to meet Eileen's mum. Phyllis took to pub life immediately, particularly the food. 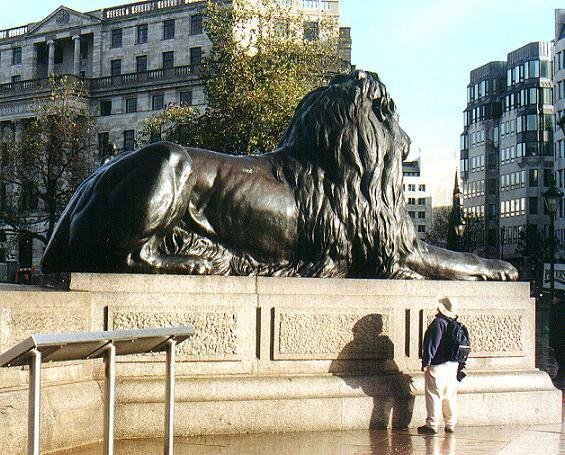 Next day Phyllis made the acquaintance of the lions on Trafalgar Square. It was a cold wet day and a raw wind was blowing. 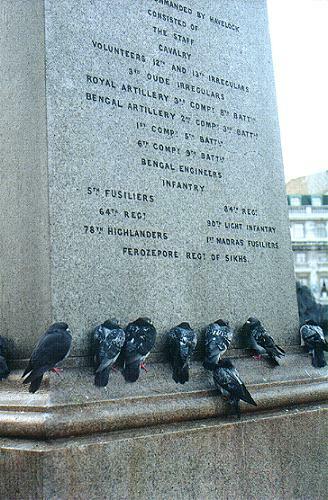 Even the pigeons were huddling up against whatever cover they could find. 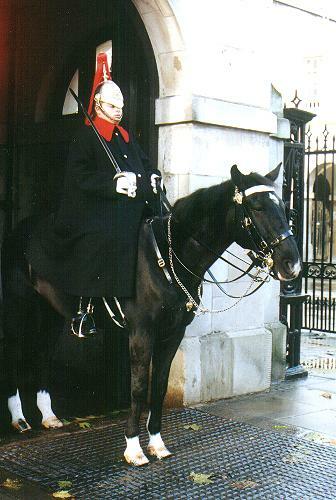 Down Whitehall Street at the Horse Guards gate, the young guardsmen wore their heavy cloaks over their colorful uniforms, and still they looked cold. 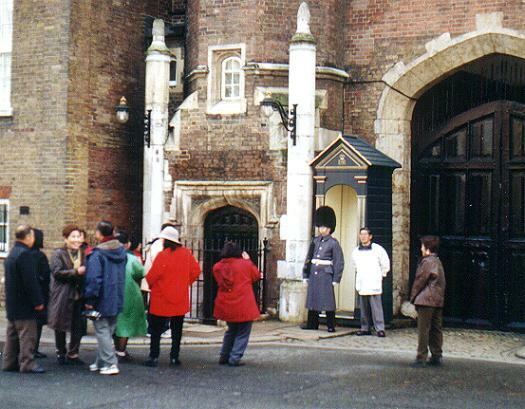 - and the following day, at St. James Palace, she got to watch the less famous Changing of the Japanese Tourists. By then the weather had improved a bit; the sky was still clouded over but the rain had stopped and the temperature was a good deal warmer. 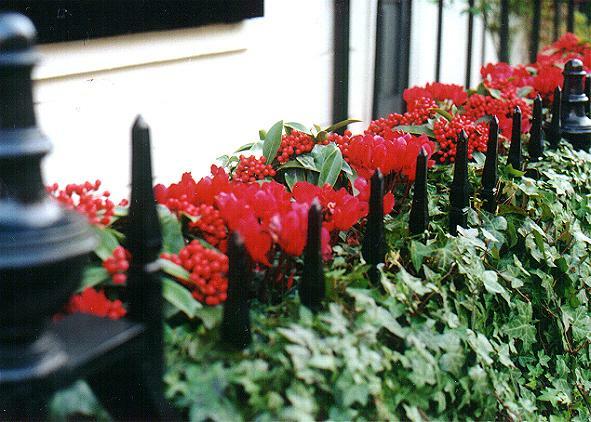 Flowers still bloomed doggedly in the boxes along the streets of Belgravia. 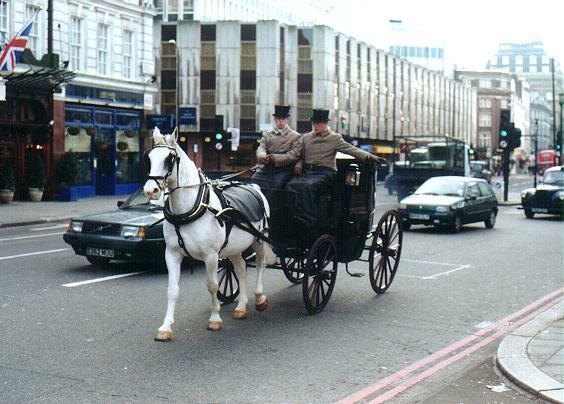 A beautiful horse-drawn carriage came rolling along Buckingham Palace Road and turned into the Royal Mews on some presumably royal business. The weather turned cold again in a couple of days. 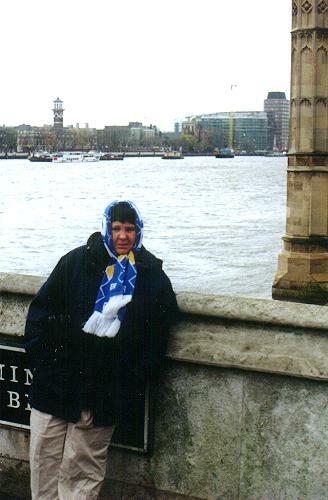 On Westminster Bridge, next to the Houses of Parliament, Phyllis turned her back to the chilly wind blowing off the Thames and tightened her Chelsea football scarf over her ears. 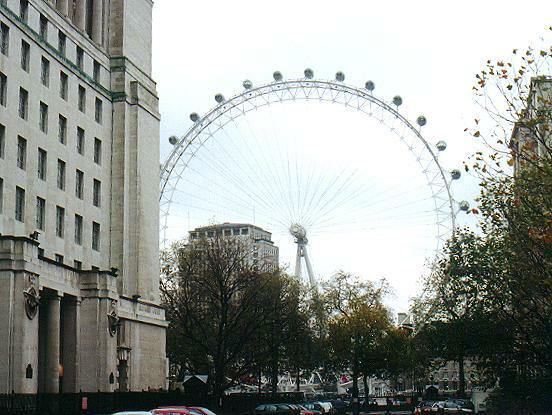 The world's biggest ferris wheel, built for Y2K. The following month some Kurdish demonstrators briefly took it over. 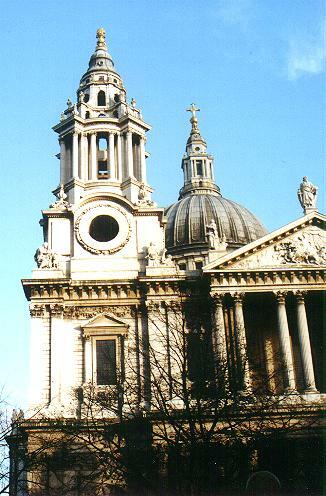 Sunday afternoon I took her to see St. Paul's Cathedral. 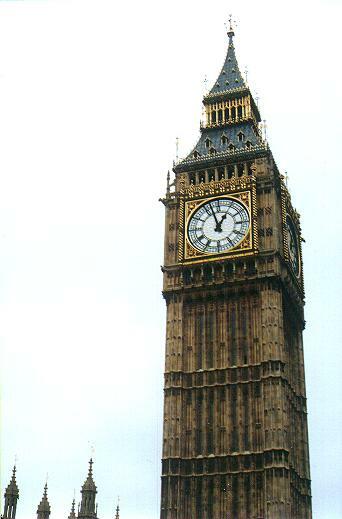 The bells were deafening. This is John Wesley. 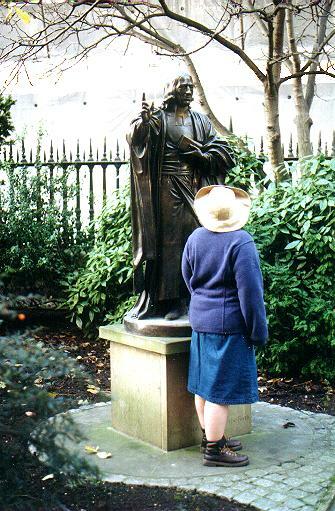 He didn't seem to approve of Phyllis, but then on the record he didn't approve of much of anything.